Glaucoma strikes Blacks about ten years earlier and more quickly than in other populations. Glaucoma is the leading cause of blindness in African Americans, and half of those with the condition are unaware they have it. Glaucoma strikes Blacks about ten years earlier and more quickly than in other populations, and if it runs in your family, your risk of getting it increases by 20 percent. Glaucoma is an eye condition that is relatively common. When the optic nerve which connects the eye to the brain, becomes damaged, there is usually a fluid buildup in the front of the eye. The progressive damage causes increased pressure within the eyeball. This damage is recognized by a loss of optic nerve tissue in a pattern called “cupping,” and by blind spots or blurry spots in the peripheral (side) vision. Advanced glaucoma can lead to permanently blurred or dimmed vision, or even to blindness. Early and moderate stage glaucoma generally has no symptoms. This is why it is important to be examined by an ophthalmologist (eye doctor) regularly to determine if you are likely to develop the disease. Researchers don’t exactly know what causes glaucoma. Increased eye pressure is the likeliest culprit and this occurs when the eye’s clear fluid (aqueous humor) fails to drain properly. Glaucoma usually occurs in both eyes, although one eye may be more affected than the other. POAG is the most common type of glaucoma and this occurs when the eye’s drainage canals become blocked, and the fluid accumulation causes pressure to build within the eye. Vision loss is usually slow and gradual and often there are no early warning signs. There is a strong genetic predisposition for this type of glaucoma. ACG is less common that POAG and this takes place when the eyes clear fluid cannot drain properly because the entrance to the drainage canal is either too narrow or is closed. In this case, eye pressure can rise very quickly and can be triggered by pupil dilation. Symptoms can include sudden eye pain, nausea, headaches, and blurred vision. If you experience these symptoms, get to an eye doctor (opthalmologist) quickly. NTG is a low pressure kind of glaucoma where the optic nerve is damaged but the eye pressure is not extremely elevated. Genetics are to blame in NTG, a family history of glaucoma, cardiovascular disease, and Japanese ancestry are a few of the risk factors here. SG is just that and is brought on by another complication like eye injury, cataracts, diabetes, eye surgery or eye tumors. In SG, damage to the fluid drainage canal is treated by meds or surgery. What are the glaucoma symptoms? Many glaucoma patients don’t always notice symptoms at the beginning stages of the condition until they have lost some of their side vision. An eyecare physician can detect glaucoma during a routine eye exam. There are painless tests given to patients to check for glaucoma, including vision tests and measurements of the pressure inside your eyes. An opthalmologist will also recomend that you make regular appointments so that he can monitor your glaucoma and determine, if whether the treatment option is doing its job. Although much still needs to be learned about why African Americans are more at risk for glaucoma, one thing is certain. Early diagnosis and treatment is key in preventing vision loss from glaucoma. 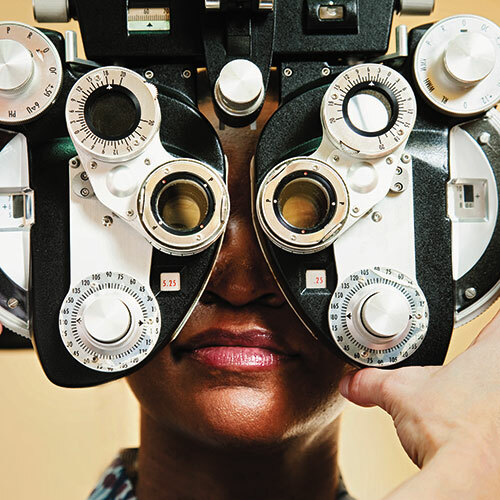 In order to maintain a lifetime of healthy vision, the American Optometric Association (AOA), recommends a comprehensive eye exam every two years for adults ages 18 to 60, and annual exams for seniors age 61 and older. Adults who wear contact lenses should have annual eye exams, according to the AOA.